Applying for a scholarship is not a stroll in a park. 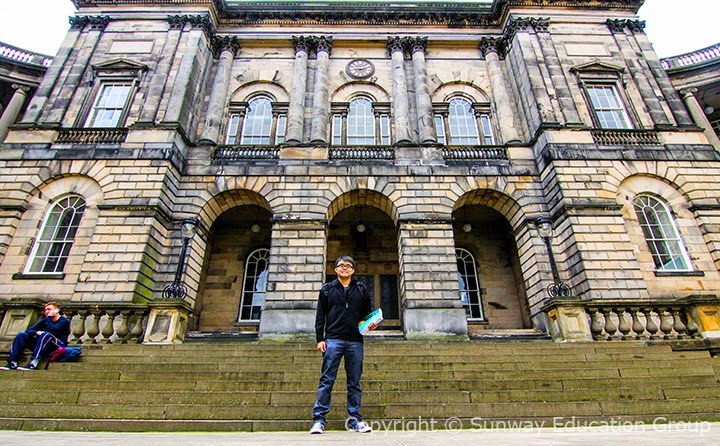 Tommy Hoo Yi Vae, Sunway College’s A-level alumnus has much to tell of continuing his studies at University of Edinburgh, Scotland. He has been offered a place in a 4-year bachelor and master degree in Economics and Statistics with a full scholarship covering his tuition fee, living expenses and a round-trip airfare. Tommy, who scored 3As in Economics, Mathematics, Physics and 1B in Further Mathematics in the November 2013 Cambridge A-level Examinations, is a fighter against all odds. He applied for more than 10 scholarships, attended over 20 interviews and group assessments, and received plenty of rejections from his various scholarship applications. “One should never give up. I believe all those rejections helped prepare me for this scholarship,” said Tommy. 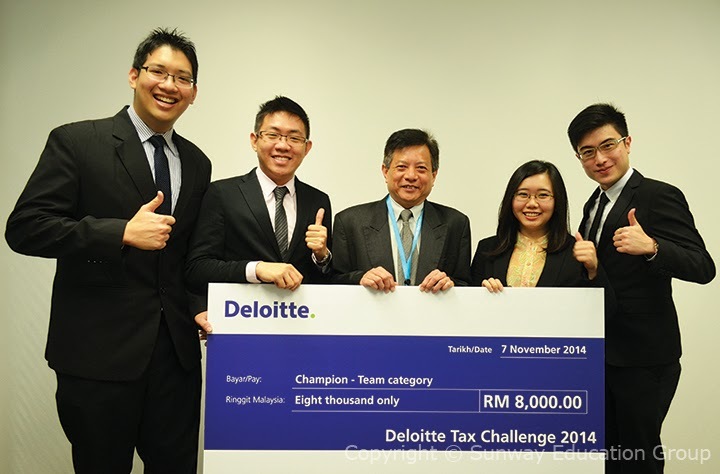 Leong Ching Yip, Ho Chan Wee, Clement Yong Yung Syin and Esther Lian Li Ling of Team Onz from Sunway TES, Sunway College Kuala Lumpur beat five other teams to emerge champions in the Deloitte Tax Challenge 2014. The team went through a preliminary challenge before being selected to the finals. The final challenge was a case study of a group of listed companies where they were tasked with coming up with solutions for tax planning & efficiency, incentive and real property gain tax (RBGT). In this final stage, teams were judged 70% on presentation and 30% on technical knowledge. 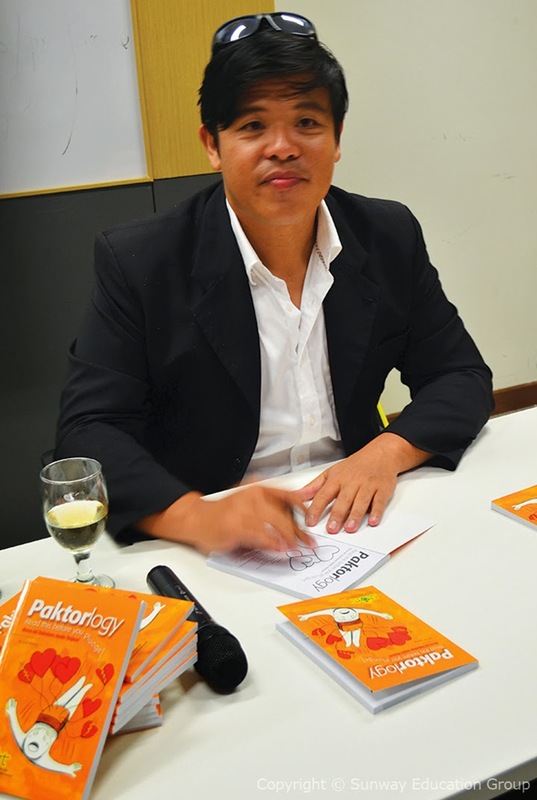 Josh Lee Awang, Sunway College A-level alumnus recently launched his book Paktorlogy at Sunway University. 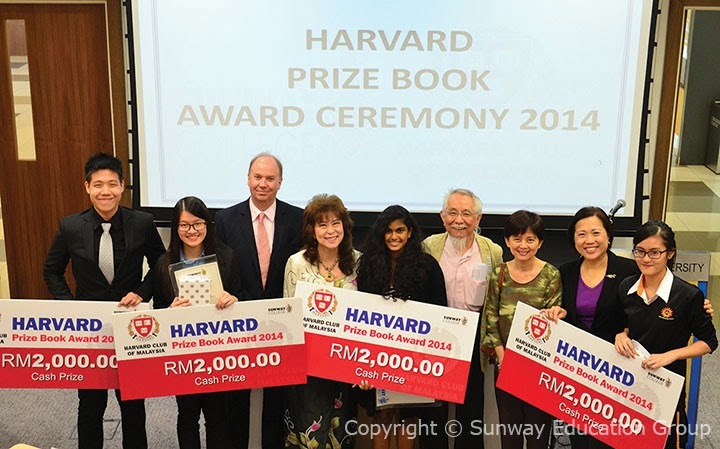 In the presence of the Sunway Education Group staff and management together with students, family members and friends, Josh gave a short presentation and talk about what his book is about. “I decided to write such a book because after counselling so many families, I realised that I could go upstream and arrest the problem early before folks even start dating and hopefully minimise the damage before it has even begun”, said Josh. 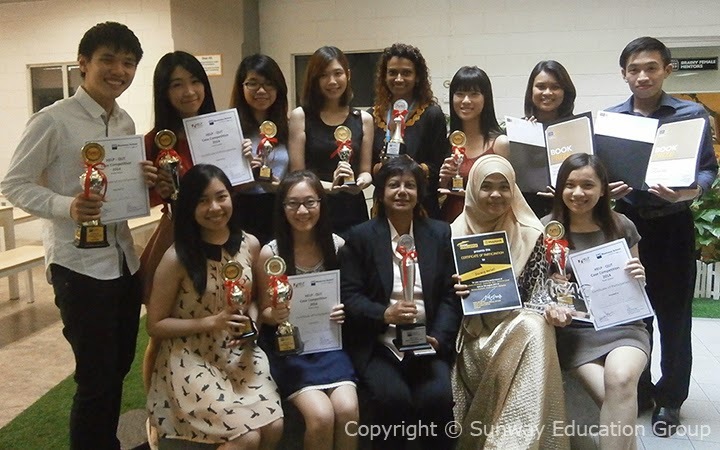 Sunway College’s Australian University Programme (AUP) celebrated its students’ achievements and success at their recently held tea party. “We are here to acknowledge, celebrate and congratulate our students before they start their last semester,” said Uma Devi Uturaju, AUP lecturer. Amongst the high achievers were two teams who participated in the Help-Queensland University of Technology (Help-QUT) student business competition. 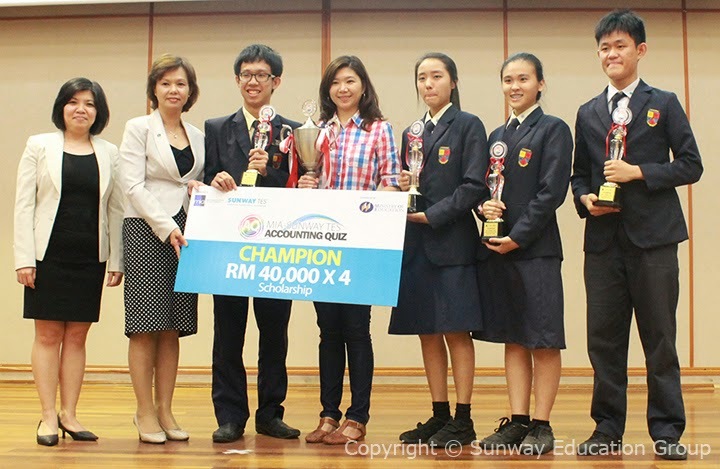 They were the champion team of Cheah Jia Ling, Ong Lee Yan, Sam Chue Zhao Hui and Saw Sher Ying; and the third runner up team of Chia Yune-Lyn, Natasha Yap Pei Ling, Kang Phaik Wa and Yee Pui Ye. The QUT competition held in Malaysia for the first time required participants to analyse a real world business case study, develop solutions and present their findings. Simulating New York’s Wall Street, the Business Investment Challenge 2014 at Monash University saw 40 pre-university students from Malaysia, Sri Lanka, Pakistan and Indonesia competed in investment skills. 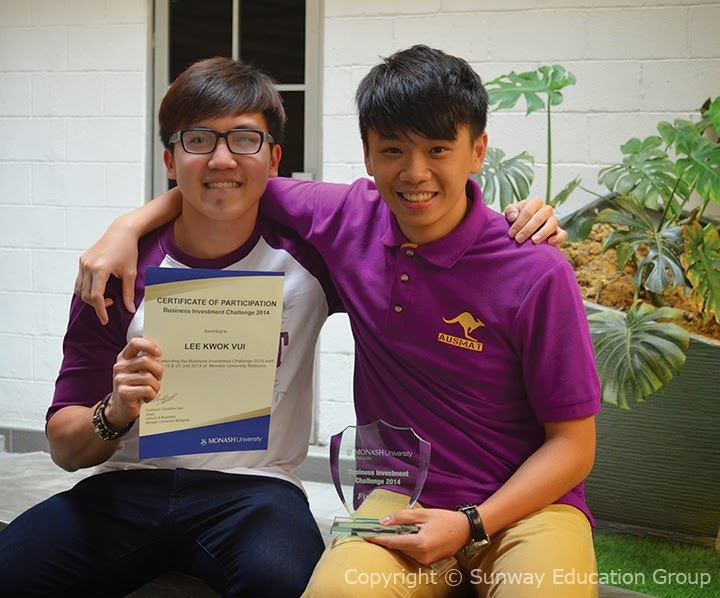 The champion team of Lee Kwok Vui and Chong Min Yu from Sunway College Australian Matriculation (AUSMAT) proved to have the talents to be potential ‘wolves of Wall Street’. Besides the team challenge, Chong also won the individual category with the highest earnings of RM5.7 million in the competition. “One has to be mentally prepared in order to win this competition. The competition is not complicated, rather I perceive the competition as a game, which helps me to stay calm and analyse the stock market better,” said Chong.